Starring: Kate Beckinsale, Theo James, Tobias Menzies, Lara Pulver, Charles Dance, James Faulkner, Peter Anderson, Clementine Nicholson, Bradley James, and more. 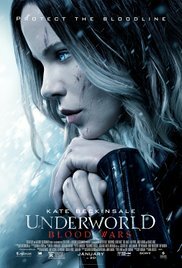 1) Acting - Total Thumbs Up: Kate Beckinsale reprises her role as the vampire Selene. Her dark, poignant looks are as sharp as ever. Theo James also returns as David. A young vampire Selene saved in the last film, he stands by her side whether she wants his help or not. Lara Pulver is pure gold as the manipulative Semira. Charles Dance and James Faulkner bring their strong presences into the cast giving it some weight. 2) Special Effects - Thumbs Up: A lot of effects fill the film. Most are quite nice. Several considerably gory. The outside area of the northern stronghold, especially the frozen waterfall, was fabulous. The obfuscate skills from the north flowed quite well. And the vampire cocoons were a neat concept. I couldn't remember from the previous films, but it seems that the werewolves in this franchise get less and less hairy with each movie. Hairless werewolves look less like werewolves and more like muscle heavy people with long muzzles. The vampires too seemed less than they should. They either had elongated teeth all the time or not at all. 3) Plot/Story - Neutral: At a mere 91 minutes, there's not much time for any real story development. Complications and backgrounds are served at breakneck speeds with no time to savor or absorb them. Character development is minimal. Lots of new enemies that just seem like more of the same because they're not given any real time to prove they're in any way different from the rest. To increase the blood and carnage, both the werewolves and the vampires seem to lose a lot of their powers. Their sense of enhanced smell, strength, and more. A lot of wounds that should repair themselves in moments don't heal at all. (Not every blade would have poison on it.) The touch of the sun and the UV bullets now kill instantaneously. Selene and Varga's cage match showed potential for cool combat skills the vampires never once use on their werewolf enemies. It's also never good when you repeatedly tell the audience how impossible something is, and yet it's taken care of easily. Worse, once the vampires realize what has been done, they do nothing to correct the issue and get the benefit of added security instead of being massacred. Oh well. 4) Stunts - Total Thumbs Up: Lots of hand-to-hand combat. Sword fights, gun fights, and combinations of those and more. The choreography from the battles was overall well done. 5) Locations/Cinematography - Total Thumbs Up: The gorgeous vistas, especially when they go north, almost make up for the plot issues. The shots from the train over the mountains were fantastic! The frozen lake with the northern lights behind them was a beautiful sight. I loved the shots of the frozen waterfall. 6) Costuming/Makeup - Total Thumbs Up: Selene wears her signature corset, leathers, and long coat. Later things get shaken up a little with some contrast changes. All the southern vampires are emo to the max. It made for a huge contrast when we're introduced to the northern coven. A strange ying and yang effect. I loved the touch of Viking and Valkyrie influence on the northern group, especially for Lena. Conclusion: If you love watching Selene kick buns, and some gorgeous cinematography, you'll enjoy the film. Just don't expect much else.